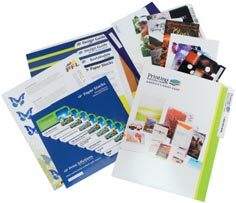 " PrintingForLess is dependable and consistent. They take the necessary steps to help me win business and deliver top-quality material for my clients. I can call my personal rep anytime, knowing I will get the support and details I need to get the best final product. I continue to recommend PrintingForLess because they're invested in my success. " "I love my business cards! I was really impressed with the print quality (I wanted very bright colors, and you guys did that perfectly! beautiful crisp details, too,) the speed at which I received my order, and the convenient packaging they arrived in." Many graphics software programs give you the choice to work in either RGB or CMYK. These are called "color spaces". Scanners and digital cameras create images using combinations of just three colors: Red, Green and Blue (called "RGB"). These are the primary colors of light, which computers use to display images on your screen. Printing presses print full color pictures using a different set of colors, the primary colors of pigment: Cyan (blue), Magenta (red), Yellow and Black (called "CMYK"). This is "4-color process" or "full-color" printing that comprises the majority of magazines and marketing materials you see every day. At some stage your RGB file must be translated to CMYK in order to print it on a printing press. You will have more control over the appearance of your printed piece if you convert all of the images from RGB to CMYK before sending them to us. When we receive RGB images, we do a standard-value conversion to CMYK, which may not be perfectly to your liking. We want you to be happy, so please, take the time to prepare your file properly. We cannot be responsible for sub-par results if you furnish your images in RGB. Even though monitors always use RGB to display colors, the colors you see on your monitor will more closely match the final printed piece if you are viewing them in the CMYK color space. 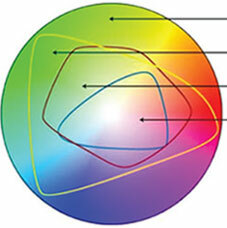 Be aware that it is possible to see colors in RGB that you can't make with CMYK. They are said to be "out of the CMYK color gamut". What happens is that the RGB-to-CMYK translator just gets as close as possible to the appearance of the original and that's as good as it can be. It's something that everyone in the industry puts up with. So it's best to select any colors you use for fonts or other design elements in your layout using CMYK definitions instead of RGB. That way, you will have a better idea of how they will appear in your printed piece. Here's a common example: many programs translate the 100% Blue in RGB into a somewhat purple-looking color in CMYK. We recommend a CMYK value of 100-65-0-0 to get a nice clean blue. Working in the CMYK color space allows you to select the CMYK recipe, or "screen build", that gives you the results you want. You most likely won't notice this kind of color shift in a color photograph. It is more likely to happen if you pick a very rich, vibrant color for a background or some other element of your layout. It probably won't look bad, it just won't look exactly the same. But it may not be noticeable at all either. To purchase a color guide with over 3,000 process colors and their CMYK screen percentages visit the CreativePro Pantone store. Here is a list of several common programs with instructions on how to make sure you are working in the CMYK color space. If your program or version is not listed here, don't worry. Most of these instructions will apply to all versions of a program. If at any time you need further help, please call us for assistance. We are happy to talk you through the steps needed to get your document into the CMYK color space. Microsoft Publisher defaults to RGB. It is easy to convert everything to a CMYK color space or to start a new document using the CMYK color space. Use the following menu options: Tools/Commercial Printing Tools/ Color Printing and select Process colors (CMYK). Please note that all images incorporated into a layout need to be linked and not embedded in order to maintain the CMYK color space within the image. Using the following menu options does this: Tools/Commercial Printing Tools/Graphics Manager and highlight the embedded image. Click Link and click Browse to locate the original file and link to it. You will then need to send both the images and the layout file to us for printing. If you do not see your program listed here, or are having difficulty converting RGB to the CMYK color space, please call us at 800-­930-2423 for further assistance.